Services are scheduled for 2 p.m. Monday, Dec. 14, at Terpening & Son Chapel for Della Maxine Shows of Artesia. Shows, 88, passed away Tuesday, Dec. 8, 2015, at Artesia General Hospital. Rev. Rick Sullivan will officiate at the services, with interment to follow at Woodbine Cemetery. Pallbearers will be James Jr., Jack and Ray Callaway, Patrick Shows, Sam Guebara and Mike Callaway. Honorary pallbearers are all of her great-grandchildren. Maxine was born Oct. 24, 1927, in Vinson, Okla., the daughter of David Akers and Fannie (Dilbeck) Akers. She came to Artesia in 1994 from Roswell. She was a telephone operator and member of First Baptist Church. 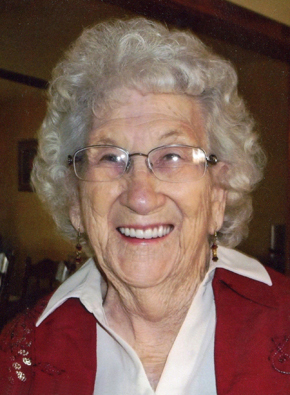 She was also a member of the Pioneers and enjoyed sewing, quilting, and playing card games, and she loved to spend time with her family. Survivors include her daughters, Jo Parks of Albuquerque and Brenda Callaway of Artesia; six grandchildren; 11 great-grandchildren; two great-great-grandchildren; and sister Shirley Collinsworth of Ruidoso Downs. She was preceded in death by her parents; daughter Judy Brown; son William Shows; two sisters; three brothers; granddaughter Callie Callaway; and great-grandson Matthew Guebara.